MOSCOW A protester arrested after a mass anti-Kremlin demonstration last year was found guilty Tuesday of beating a policeman and sent for forced psychiatric treatment, a ruling human rights activists decried as a return to the Soviet practice of using punitive psychiatry against dissidents. Mikhail Kosenko was one of 28 people rounded up after clashes broke out between protesters and police on the eve of Vladimir Putin's inauguration for a third term as Russia's president. Kosenko was diagnosed in 2001 with mild schizophrenia, but his condition was controlled by medication and he had never shown any aggression, according to a statement from Human Rights Watch. The prosecution, however, said a psychiatric evaluation found that Kosenko was unable to realize the "public danger of his actions" due to a "chronic mental disorder." Human Rights Watch not only objected to the use of forced psychiatric treatment but also questioned the charges brought against Kosenko. "The majority of the evidence, including from the police officer himself, indicates that Kosenko never touched him," Tanya Lokshina, the rights group's Russia program director, said in the statement. Kosenko was among tens of thousands who took part in the protest on Bolotnaya Square in Moscow on May 6, 2012. He was arrested in July 2012 and has remained in custody ever since. The court refused his appeals for release, including denying his request to attend his mother's funeral last month. Since returning to the presidency, Putin has cracked down on street protests and other demonstrations of dissent. Some of the defendants in what has become known as the Bolotnaya case face up to 10 years in prison if convicted. The only two other defendants in the case to have received a court ruling were sent to prison on lighter sentences after they cooperated with the prosecution. 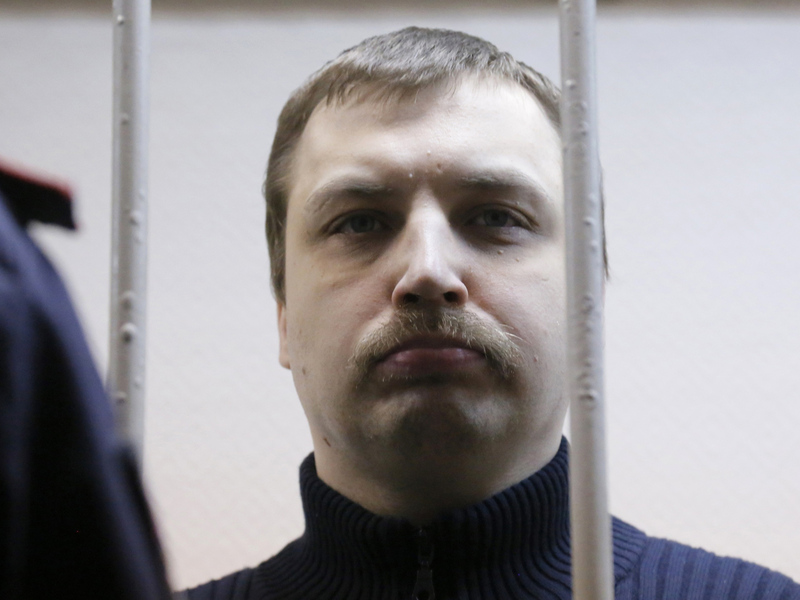 Judge Lyudmila Moskalenko found Kosenko guilty of mass rioting and using force against an official. But she said the court would release him from criminal responsibility "for insanely conducting actions forbidden by law" and impose "compulsory medical measures in the form of forced treatment in a general psychiatric facility." Rights activists compared it to the Soviet practice of locking up dissidents in psychiatric institutions. "It's definitely a revival of punitive medicine," said Olga Romanova, a journalist and rights activist. "And that's the most horrible thing of all. I think one can only envy those who will be sentenced to prison terms and not to treatment in a medical institution, a Russian medical institution."